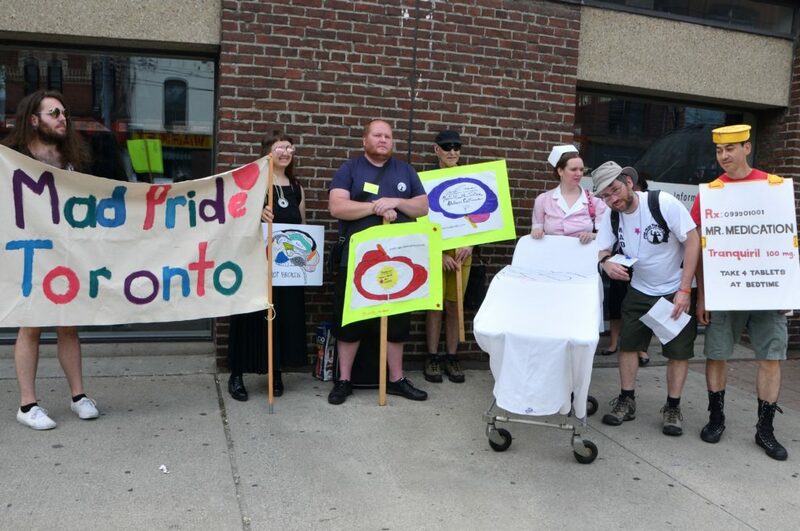 There is no organizing committee for Mad Pride week in 2018. Thanks for your support over the years. 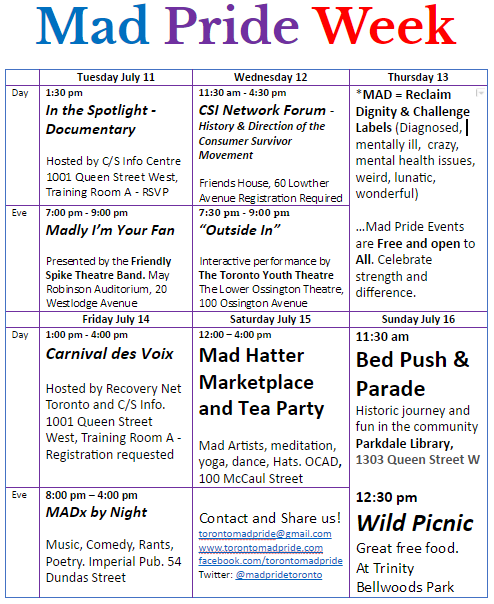 Mad Pride Poster 2017 is here! 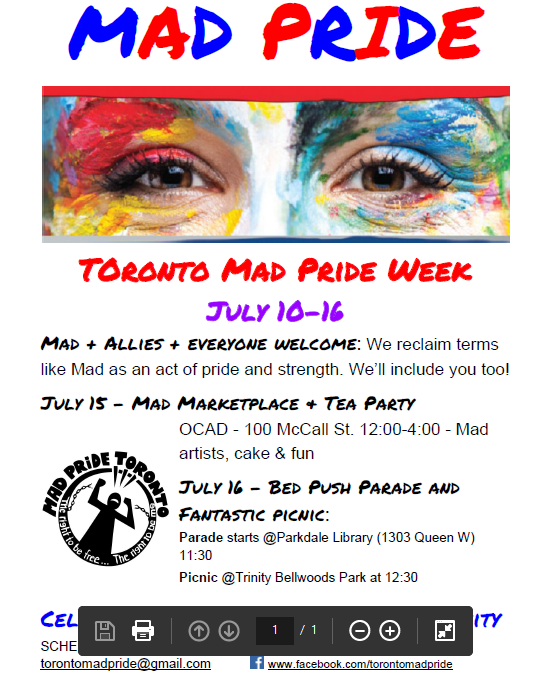 Thanks for sharing our Mad Pride Week 2017 Poster! Mad + Allies + everyone welcome: We reclaim terms like Mad as an act of pride and strength. We’ll include you too! Now is the time to raise your voice! And Hear Ours! Our strength comes from sharing our Mad talents and Mad spirits. Join us this Thursday, February 2, 2017 at 8:00 at the Gladstone Hotel, Ballroom. Let us know you are coming via our Raised Voices Facebook event. Hailing from the mysterious university town of Peterboroughshire-upon-the-Ottonabee, Dr. Anderson is a Rock and Roll Musician bent on ruining the perceptions of the allegedly sane. 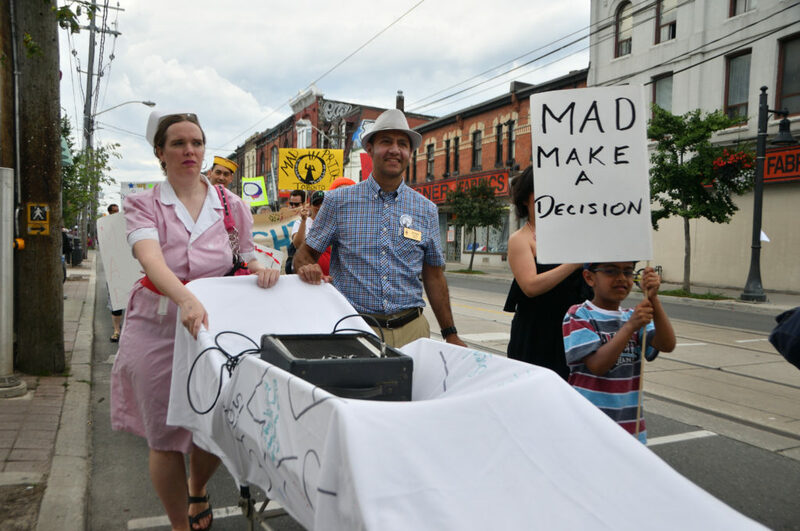 Jenny has been a mad activist in the community since 2012. She is experiencing a creative reawakening after a long dry spell. Quarry Bay is a musician, producer, ethnographer, and anarchist based in Toronto and Hong Kong. His music and studies focus on anti-racism, madness, and the inevitable demise of the capitalist nation state. He is currently interested in examining how madness and oppression intersect. Asante is a spoken word artist who mesmerized audiences at both the July Mad X and the November Mad X. Here he is making his Gladstone debut. 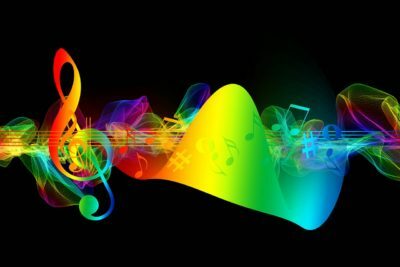 He is a Toronto musician who is part of the Kensington Market music scene / community for the past 25 years. Tom is a Proud Mental Health Survivor!. Donna is a maniac. The most apt insult she’s ever received was “Soviet Barbie”. Felix is an eclectic retro hippie far beyond perfume and bohemian; but Felix is a people person who is poly-amorous towards everything in life. 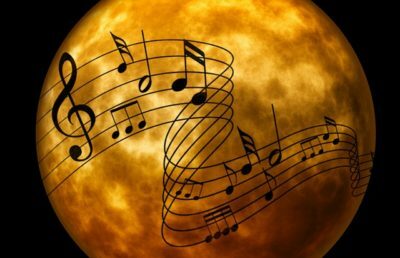 The Threesomes music can be described as being folk with lyrics that are love-fantasy. Ladies and gentlemen open your hearts to Toronto’s very own, Felix and the Threesomes. Stacey Bowen is a short story writer who mixes fiction with non-fiction around human life-struggles. She is also a trained Motivational Speaker who advocates for changes to Social Polices and more subsidized Housing. Stacey values her job that deals with helping the homeless population, and working with people living with mental illness and addictions by doing her frontline job as Shelter-Relief Worker at Fred Victor. Want to get involved, ask a question or launch a new initiative? Saraƒin is a writer, illustrator, cartoonist, and mad identified person. Asylum Squad, the webcomic, was born during a year long stay in a Toronto mental institution as a creative means of passing Saraƒin’s time. She will be selling her work at the Mad Hatter Street Fair and Marketplace. Asylum Squad – Saraƒin’s long running Mad Comic! What are you most excited about with your new book, Asylum Squad: The Jung Ones 2? I am excited, as I always am, at the prospect of making new fans, and advancing the storyline. This book was the most action packed in the series thus far, and was a joy to work on. What do we need to know from previous issues to understand the new book? It helps to have at least read The Jung Ones pt 1, even better to have read Monster Hospital 1 & 2. There are recaps in each new volume of events that occurred in previous books. Basically, at this point, Liz Madder and company are well into the Ajna Project: an experimental drug treatment program based on Jungian psychiatry, that they signed up for, and were accepted into, during their stay at St Dymphna’s psychiatric hospital. How do you describe your experience with madness? I do not like psychiatric labels, for I have been given many in my life, and none of them seemed to stick or describe me very well. I prefer to use the term Mad, even though I don’t consider myself a “sufferer of mental illness” – rather, I feel that I see the world through an unusual perspective due to a form of spiritual emergency that started in my mid 20s. 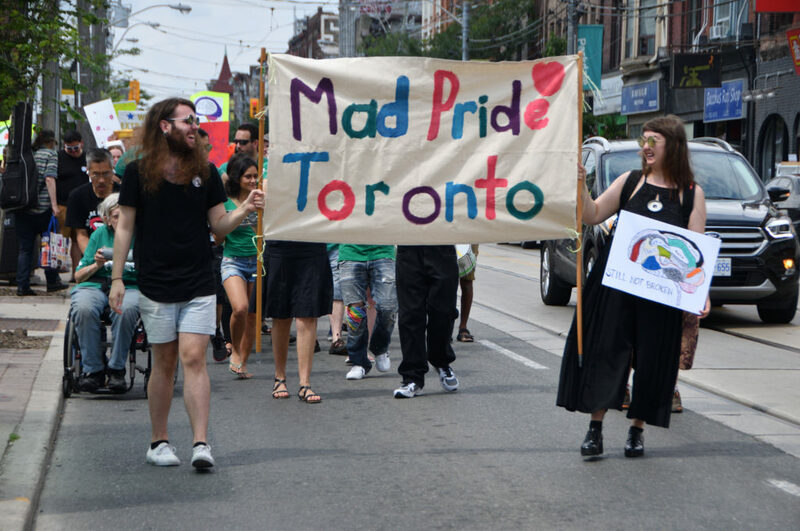 What does Mad Pride mean to you?